2019 National Drug & Alcohol Facts Week®: January 22nd– January 27th, 2019. National Drug & Alcohol Facts Week links students with scientists and other experts to counteract the myths about drugs and alcohol that teens get from the internet, social media, TV, movies, music, or from friends. It was launched in 2010 by scientists at the National Institute on Drug Abuse (NIDA) to stimulate educational events in communities so teens can learn what science has taught us about drug use and addiction. The National Institute of Alcohol Abuse and Alcoholism became a partner in 2016, and alcohol has been added as a topic area for the week. NIDA and NIAAA are part of the National Institutes of Health. 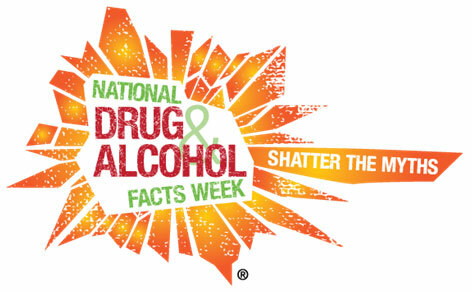 What happens during National Drug & Alcohol Facts Week®? Why Observe National Drug & Alcohol Facts Week®? Many teens are not aware of the risks to their health, to their success in school, and to their safety while driving under the influence. When teens are given the scientific facts about drugs, they can be better prepared to make good decisions for themselves and they can share this information with others.